Donna Snyder-Smith, world renowned endurance trainer, author, and coach to current World Champion Valerie Kanavy, has written, "Halynov is one of the most beautifully balanced Arabian athletes I have ever seen in my life. I was impressed when I saw his body... but when I saw him move... he took my breath away! Pico Nightrider (16.1 h), who was the first offspring of this Arabian sport horse stallion to enter racing, broke his maiden race at Los Alamitos by seven and one-half lengths and was subsequently purchased by Valerie Kanavy, the World Endurance Champion. He was being ridden for her by Kristen Snook who did an excellent job of rebuilding his trust from a very unpleasant experience at the racetrack. They finished FIFTH in point standings for the AERC Northeast Region Featherweight Division for 1999! Valerie wrote Bev Scott (well respected race trainer) after one of Pico's grueling events, that he looked as though he had not even been in a race. Although Val took his training very slow (due to his "less-than-wonderful" experience at the racetrack), in 1999 (his first year of competition with Kristen) he finished 7th in the very challenging Biltmore 100. He finished 6th in the FEI Division and 7th in the AERC Division of the highly competitive Cosequin Challenge. He received the competition's high vet score. Over Thanksgiving 1999 he came in Third behind Jedi at the Carolina 100! Great job, Kristen! In the year 2000, Pico (what an ironic nickname, huh?) and Kristen burned up the trails with a fourth place at the Hallelujah Benefit National Championship Qualifying Ride, 75 miler! A dressage trainer located near Val recognized Pico Nightrider's extraordinary athletic ability and purchased him from Valerie for dressage competition. Valerie had also purchased Halynov's daughter Halynova for breeding. Becky Hart was so impressed by the Halynov daughter Halyva Filly whom she had been training for a syndicate that she went out and found one of her own, WOA Maria! You certainly cannot get higher praise of a bloodline than having two world champions both training and owning his offspring! She trained Halyva Filly for a syndicate and reportedly sold the gorgeous and talented mare to a Princess in the Arab Emirate. Ernie Lohman took Halynov's son WOA Don Juan to Second Place Pacific SW Region AERC 2000 Heavyweight Division after finishing fifth in the Pacific Region Best Condition standings for 1999! In his first year of competition he was THIRD in 1998 and FOURTH in 1999 in the Heavyweight Division for AERC's Pacific Southwest Region! In 1999, he took third in the Malibu 50, and 2nd in the Charleston 75 as well as Best Condition in that race. In 2000 Ernie started out the year with Don Juan's 6th place in the 20 Mule Team National Championship 100 Qualifying Ride, moving up to 5th place in the Fire Mountain 50 miler, and snatching FIRST place AND BEST CONDITION in the heavyweight division of the 65 mile Gambler's Special! Way to go, Ernie! I guess Ernie's not a sports medicine therapist for nothing! Ernie told me that Don Juan's P&R's were phenomenal which has certainly been borne out with all of his BEST CONDITIONS! Two of Halynov's sons, WOA Russian Silk,and WOA Halyva Guy, were in training with Red Shield Equestrian, home of Tevis Cup winner, On A High. Red Shield prepares their racing stock for lease to world competitors for international competition. Frank was devastated when Halyva Guy met with a tragic and fatal accident on his first endurance ride. Another Hal son placed Third in point standing for AERC's Northwest Region in 1999! I hadn't seen WOA Centurian since he was left our place as a yearling! We congratulate Rick Kozol on his success! He moved from 29th in the Prineville 50 to 14th in the Limestone Challenge 50 to 7th in the Stookey Stampede 50. He then went on to take 3rd in the Bandit Springs 50, 3rd in the Santiam Cascade 50 and 4th in Headwaters of the Rogue, 4th in the Oregon 75 miler, and 2nd in the Kahnecta 50! Watch your backs! Claude Brewer purchased a Halynov son Hal Bentfr Leathr and reported that Ben's babies have been winning in endurance rides -- not only winning, but also selected consistently as Best Condition at the end of the meets. Although Ben tragically died all too young in an accident, his three daughters are burning up the endurance trail! One completed a 50 miler in 5 hrs and 28 minutes with a 48 heart rate on her first time in competition! The second daughter was 2nd for heavyweight division (for non- endurance riders -- heavyweight refers to the rider/gear weight) in the National Championships, and she had the second lowest heart rate. The third daughter has such a low heart rate -- 32 -- that Claude feels that she will make a terrific 100 mile horse. Claude has the distinction of being the only one from the East Coast who has successfully completed the Tevis TWICE! As Donnis Thran once said of Halynov, "If you aren't riding one of his offspring, you'll be chasing them!" Donnis, who has helped many endurance and sport horses with her laser therapy techniques bought Halpaso, full brother to Valerie's Halynova. 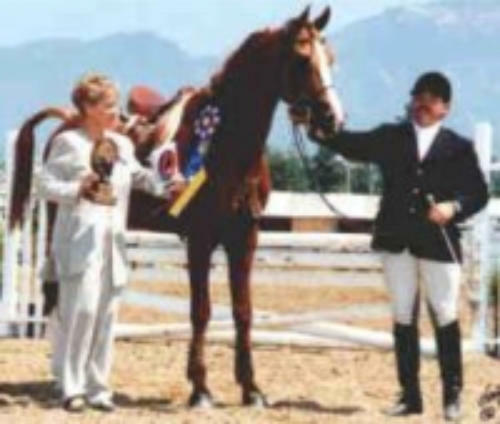 Because of Halynov's physical prowess and Donna Snyder-Smith's high praise of Halynov, this Arabian stallion's get and now grand-get are in constant demand in endurance circles. Halynov’s son Riverdance demonstrates the same heart and athletic ability as his sire. Like his sire, he has the talent to achieve the highest levels in Dressage, according to Dressage instructor, Irene Murphy. A wonderful testament to Halynov’s ability to pass on his excellence to his offspring. Riverdance and Halyva Dame, his last daughter were Halynov’s last gifts to us. Halynov in Gold was Halynov’s last son and brother to Hal Bentfr Leather . I dug up my old video of Hal Bentfr Leathr when Claude called me about all his offspring’s endurance ride achievements. The true greatness of a stallion is the ability to pass his traits on to his offspring and grand offspring -- and that Halynov has done. Please look at the News and Hal Bentfr Leathr and Riverdance video pages to get a glimpse of what excellence Halynov passed on to his offspring. Visit Halynov’s Tribute and Show Pages to learn more about this tremendous Russian stallion, as well as view his athletic pedigree by clicking here or on the names to links underneath images above. Pico Nightrider (16.1 h), who was the first offspring of this Arabian sport horse stallion to enter racing, broke his maiden race at Los Alamitos by seven and one-half lengths and was subsequently purchased by Valerie Kanavy, the World Endurance Champion. He was being ridden for her by Kristen Snook who did an excellent job of rebuilding his trust from a very unpleasant experience at the racetrack. They finished FIFTH in point standings for the AERC Northeast Region Featherweight Division for 1999! Valerie wrote Bev Scott (well respected race trainer) after one of Pico's grueling events, that he looked as though he had not even been in a race. Although Val took his training very slow (due to his "less-than-wonderful" experience at the racetrack), in 1999 (his first year of competition with Kristen) he finished 7th in the very challenging Biltmore 100. He finished 6th in the FEI Division and 7th in the AERC Division of the highly competitive Cosequin Challenge. He received the competition's high vet score. Over Thanksgiving 1999 he came in Third behind Jedi at the Carolina 100! Great job, Kristen! In the year 2000, Pico (what an ironic nickname, huh?) and Kristen burned up the trails with a fourth place at the Hallelujah Benefit National Championship Qualifying Ride, 75 miler! A dressage trainer located near Val recognized Pico Nightrider's extraordinary athletic ability and purchased him from Valerie for dressage competition. 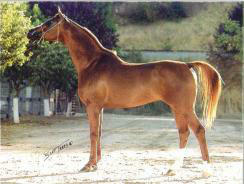 Valerie had also purchased Halynov's daughter Halynova for breeding. Becky Hart was so impressed by the Halynov daughter Halyva Filly whom she had been training for a syndicate that she went out and found one of her own, WOA Maria! You certainly cannot get higher praise of a bloodline than having two world champions both training and owning his offspring! She trained Halyva Filly for a syndicate and reportedly sold the gorgeous and talented mare to a Princess in the Arab Emirate. Ernie Lohman took Halynov's son WOA Don Juan to Second Place Pacific SW Region AERC 2000 Heavyweight Division after finishing fifth in the Pacific Region Best Condition standings for 1999! In his first year of competition he was THIRD in 1998 and FOURTH in 1999 in the Heavyweight Division for AERC's Pacific Southwest Region! In 1999, he took third in the Malibu 50, and 2nd in the Charleston 75 as well as Best Condition in that race. In 2000 Ernie started out the year with Don Juan's 6th place in the 20 Mule Team National Championship 100 Qualifying Ride, moving up to 5th place in the Fire Mountain 50 miler, and snatching FIRST place AND BEST CONDITION in the heavyweight division of the 65 mile Gambler's Special! Way to go, Ernie! I guess Ernie's not a sports medicine therapist for nothing! Ernie told me that Don Juan's P&R's were phenomenal which has certainly been borne out with all of his BEST CONDITIONS! Two of Halynov's sons, WOA Russian Silk,and WOA Halyva Guy, were in training with Red Shield Equestrian, home of Tevis Cup winner, On A High. Red Shield prepares their racing stock for lease to world competitors for international competition. Frank was devastated when Halyva Guy met with a tragic and fatal accident on his first endurance ride. Another Hal son placed Third in point standing for AERC's Northwest Region in 1999! I hadn't seen WOA Centurian since he was left our place as a yearling! We congratulate Rick Kozol on his success! He moved from 29th in the Prineville 50 to 14th in the Limestone Challenge 50 to 7th in the Stookey Stampede 50. He then went on to take 3rd in the Bandit Springs 50, 3rd in the Santiam Cascade 50 and 4th in Headwaters of the Rogue, 4th in the Oregon 75 miler, and 2nd in the Kahnecta 50! Watch your backs! Claude Brewer purchased a Halynov son Hal Bentfr Leathr and reported that Ben's babies have been winning in endurance rides -- not only winning, but also selected consistently as Best Condition at the end of the meets. Although Ben tragically died all too young in an accident, his three daughters are burning up the endurance trail! One completed a 50 miler in 5 hrs and 28 minutes with a 48 heart rate on her first time in competition! The second daughter was 2nd for heavyweight division (for non-endurance riders -- heavyweight refers to the rider/gear weight) in the National Championships, and she had the second lowest heart rate. The third daughter has such a low heart rate -- 32 -- that Claude feels that she will make a terrific 100 mile horse. Claude has the distinction of being the only one from the East Coast who has successfully completed the Tevis TWICE! As Donnis Thran once said of Halynov, "If you aren't riding one of his offspring, you'll be chasing them!" Donnis, who has helped many endurance and sport horses with her laser therapy techniques bought Halpaso, full brother to Valerie's Halynova. Because of Halynov's physical prowess and Donna Snyder-Smith's high praise of Halynov, this Arabian stallion's get and now grand-get are in constant demand in endurance circles. Halynov’s son Riverdance demonstrates the same heart and athletic ability as his sire. Like his sire, he has the talent to achieve the highest levels in Dressage, according to Dressage instructor, Irene Murphy. A wonderful testament to Halynov’s ability to pass on his excellence to his offspring. Riverdance and Halyva Dame, his last daughter were Halynov’s last gifts to us. Halynov in Gold was Halynov’s last son and brother to Hal Bentfr Leather . I dug up my old video of Hal Bentfr Leathr when Claude called me about all his offspring’s endurance ride achievements. The true greatness of a stallion is the ability to pass his traits on to his offspring and grand offspring -- and that Halynov has done. Please look at the News and Hal Bentfr Leathr and Riverdance video pages to get a glimpse of what excellence Halynov passed on to his offspring. Standing at 16.2 hands, purebred Arabian stallion TLA Halynov brought size, tremendous power and correctness to his foals. With four crosses to Priboj and the golden Arax/Aswan/Salon cross, Halynov could not help but produce athletic ability. The Tersk breeding program in Russia combined the best of the Polish, Crabbet, Egyptian, and French programs to produce big athletic Arabian racing stock. Visit our Russian Arabian History page to learn more about the exceptional breeding program at Tersk, Russia.